The Indian markets are gearing up for the big event today — the Union Budget. We take a look at what the commodity market participants expect from it. If there is one wish that tops the list for almost all participants in the commodity sector, it is the removal of the commodity transaction tax (CTT) that was introduced in July 2013. This tax is levied on the sale transaction of the commodity futures except for exempted agricultural commodities such as chana, soyabean, turmeric, etc. Singhal also adds that the increased trading cost has moved the domestic trading business to offshore markets like Dubai and Singapore. Data from MCX shows that trading volumes have declined from an average ₹149 lakh crore in 20011-12 to ₹54 lakh crore in 2014-15. In NCDEX, the volumes have slumped from an average ₹18.22 lakh crore in 2011-12 to ₹10.22 lakh crore in 2014-15. Some of these volume declines are also a result of the commodity price meltdown. NCDEX too expects some relief on CTT for processed agri-commodities like sugar and soyaoil. Hareesh V, Research Head, Geofin Comtrade, says the gold and gem industry is expecting a reduction in import duty on gold to 2 per cent from 10 per cent. Increasing the gold import duty in August 2013 was one of the several measures the government had taken in order to bring down the current account deficit (CAD). India’s CAD has improved from $21.8 billion in June 2013 to $8.2 billion as of September 2015. Hareesh adds that in order to protect domestic growers from cheap imports, the rubber industry is expecting an increase in the import duty on natural rubber to 40 per cent from 25 per cent. Similarly, an import duty cut to 5 per cent from 30 per cent is expected for oilseeds. Sushil Sinha, Head of Karvy Comtrade, wants the Centre to introduce measures to help companies hedge their commodity exposure risk. He also wishes that the Centre allocates more fund and speeds up the process of setting up a national unified agri-commodity market. He also wants improvement to infrastructure in terms of warehouses, testing labs, research, etc. Sinha believes participation in the commodity market will improve if a clearing and settlement corporation comes up for commodities, like the one prevailing for equities. NCDEX wants the Budget to introduce measures to allow banks and asset management companies to invest in the commodity futures market. Also, with commodity market regulation being taken over by the Securities and Exchange Board of India, NCDEX expects the introduction of new products like options and new indices, going forward. The International Copper Study Group (ICSG) has released preliminary data for the month of November last year in its February 2016 Copper Bulletin. According to preliminary ICSG data, copper production and usage data points to a marginal production deficit of nearly 25,000 metric tonnes. The refined copper market balance for the month of November ‘15 showed an apparent production deficit of nearly 25,000 metric tonnes. The production deficit for the month, after making seasonal adjustments for global refined copper production and usage, stood at 20,000 metric tonnes. The refined copper balance for the initial eleven months of the year ended in production surplus of around 50,000 metric tonnes as compared with a deficit of around 545,000 tonnes during the corresponding period in 2014. World refined production increased by nearly 1.6% (nearly 330,000 t) during the first eleven months of 2015. Primary production was up 2%, whereas the secondary production held steady. The refined copper production during the month witnessed significant growth of 4.0% in China. The production by the US witnessed an increase of 1.5%. On the other hand, the refined copper output by Chile and Japan dropped by 1.5% and 4% respectively. 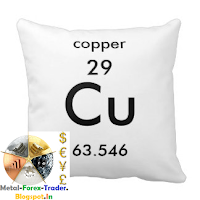 The African and Asian region recorded 3% rise in refined copper production each. On the other hand, refined output declined by 5% in the Oceania region. The world copper mine production has increased by around 3.5% (nearly 580,000 t) during the first eleven months of 2015. Concentrate production was up 4% during the period. The mine output from Peru and Indonesia recovered during this period. The mine production by Peru-the world’s third largest copper mine producer, increased by 19%. The production increased marginally by 0.8% and 2% in Chile and the US respectively. Region-wise, Asia recorded 8% rise in production. Also South America and North America recorded 4% and 2% increased output respectively. On the other hand, Africa and Oceania region recorded production decline of 1% and 3.5% respectively. Meantime, global usage of the metal is estimated to have declined by around 1% (nearly 260,000 t) during January to November in 2015. The Chinese apparent demand increased marginally by nearly 2%. The usage by world countries excluding China has dropped by 4%. The Russian apparent usage dropped sharply by 48% whereas the EU demand declined 4%. Japanese apparent demand too witnessed sharp decline of 7%. Gold gave up $8.70 last week (after the previous week's gain of $81.30/oz.) to close at 1,230 and printed a bearish harami candlestick on the weekly chart. Friday's close was on resistance at 1,230. Look for support at 1,190. A breakout from the 34-month exponential moving average (chart) would be very bullish. Assuming a breakout, our price target is 1,370. A 4yr cycle low is due in the first half of 2016 possibly as early as Feb/March but It looks increasingly as if it may have arrived last December. Wait for a breakout from the 34-month moving average to make that decision. Weekly cycles point to a high in late March. There are 60 major stock exchanges throughout the world, and their range of sizes is quite surprising. As Visual Capitalist's Jeff Desjardin notes, at the high end of the spectrum is the mighty NYSE,representing $18.5 trillion in market capitalization, or about 27% of the total market for global equities. At the lower end? Stock exchanges on the tiny islands of Malta, Cyprus, and Bermuda all range from just $1 billion to $4 billion in value. Even added together, these three exchanges make up just 0.01% of total market capitalization. There are 16 exchanges that are a part of the “$1 Trillion Dollar Club” with more than $1 trillion in market capitalization. This elite group, with familiar names such as the NYSE, Nasdaq, LSE, Deutsche Borse, TMX Group, and Japan Exchange Group, comprise 87% of the world’s total value of equities. Added together, the 44 names outside of this aforementioned group combine for just $9 trillion, or 13%, of the world’s total market capitalization. From a geographical perspective, it is the Northern Hemisphere that is dominant. North America and Europe both hold 40.6% and 19.5% respectively of the world’s markets, and the vast majority of Asia’s 33.3% lies north of the equator in places like Shenzhen, Hong Kong, Tokyo, and Shanghai. Notable exchanges that are south of the equator include the Australian Securities Exchange, the Indonesia Stock Exchange, the Johannesburg Stock Exchange and the Brazilian BM&F Bovespa. "Our economy has got very strong long-term fundamentals. And you know, your policy-makers and regulators here - we're very vigilant." 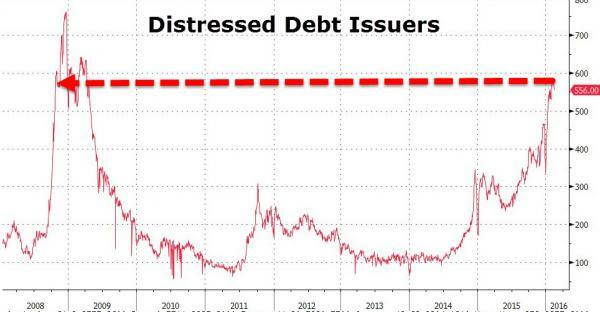 If "everything's fixed," then why is the number of distressed debt issuers still the highest "since Lehman." And the answer is not - it's just energy and it's different this time. The global copper market has recorded a surplus of 146,000 tonnes during the whole year 2015, as per the latest metals balances report published by the World Bureau of Metal Statistics (WBMS). It must be noted that the worldwide copper market had reported a surplus of 116,000 tonnes for the entire year 2014. The global mine production during 2015 totaled 19.28 million tonnes. The mine production has grown by 4.3% when matched with 2014. Meantime, global refined copper output jumped higher by 0.7% over the previous year to 23.08 million tonnes. Refined copper output by NAFTA region countries reported significant increase of 85,000 tonnes during the year. Also, refined copper production was up sharply by 27,000 tonnes in India during 2015. The global copper demand during 2015 stood at 22.931 million tonnes, essentially flat when compared with 22.811 million tonnes during 2014. The Chinese apparent consumption increased marginally by 148,000 tonnes during the year to total 11.451 million tonnes. The Chinese demand accounted for nearly 50% of the global demand. Also, EU-28 apparent consumption reported marginal decline of 2.4% from 2014 levels to 3.311 million tonnes. According to the report, reported stocks of the metal stood higher by 143,000 tonnes during the entire year 2015 when compared with 2014 closing. However, stocks fell during the month of December last year. The refined copper output during the month of December 2015 alone was 2,000.60 kt, whereas consumption during the month totaled 2,046.10 kt. The recent rout in commodity prices has sent global markets into a tizzy. But the ongoing volatility could be a friend of a commodity trader. For traders in India, there are two categories of commodities available for trading. The first is agri-commodities, such as cotton, cardamom, soybean and castor seed that are traded on the National Commodity and Derivatives Exchange (NCDEX) and the Multi Commodity Exchange (MCX). The second is non-agri commodities, such as base metals, precious metals and energy commodities that are more actively traded on the MCX. Now, unless you know what really moves agri-commodity prices, the risk of burning your fingers is quite high. Also, the market depth is low. Nithin Kamath, founder and CEO of discount brokerage firm Zerodha, says “agri commodities are riskier to trade and it is better to avoid trading them unless you know the factors that drive their prices”. The risk is lesser with non-agri commodities. There is better liquidity and the prices move in sync with global rates; so, the scope for market manipulation is low. Here’s a quick reckoner for trading in non-agri commodities on the MCX. Gold, silver, aluminium, nickel, lead, zinc, copper, crude oil and natural gas can be traded on the MCX. You can take bets on the price movements of these commodities by buying or selling futures contracts, the prices of which move in sync with the global prices of the commodities and the local currency movements. The futures contracts on the commodities are available for trading on the MCX between 10 am to 11:30/11:55 pm on weekdays, much longer than the trading window for equity futures contracts. The sizes of these contracts are generally huge, for instance, five tonnes of aluminium and 100 barrels of crude oil — that’s to suit the requirements of those who physically deal in these commodities. 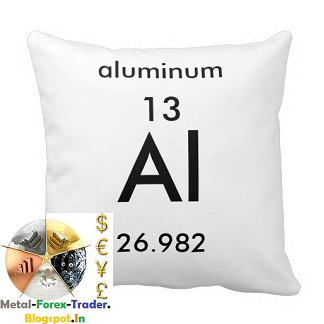 But traders who seek smaller bets can make use of the mini contracts that come with smaller lot sizes of, say, one tonne of aluminium and 10 barrels of crude oil. So, a 10 barrel crude oil mini contract will currently have a notional value of about ₹21,500 against ₹2,15,000 for a normal 100 barrel contract. Also, you don’t have to put up the ₹21,500 upfront. Futures contracts allow you to take bets by placing margin money — a portion of the notional value of the contracts. For instance, by putting up ₹1,075 (5 per cent of ₹21,500), you can buy or sell one lot of the crude oil mini contract. But note that you have to keep adequate money in your trading account to make up for the day-to-day price fluctuations in the contract until you exit your position — this is called mark-to-market provisioning. So, if the contract price moves against your bet, your account will be debited and if it moves in your favour, you will get money in your kitty. From a time perspective, you can trade either in short-term contracts or those with longer tenures. Liquidity and price discovery may not be good in long-term contracts; so, it may be better to trade in those with shorter tenures. The trade position, whether buy or sell, automatically gets settled on the expiry date of the contract or it can be squared-off and closed even before by taking an opposite position. As a seller, if you intend to settle on expiry instead of squaring-off before, take note of the dates and timeline by when you need to inform the exchange about specific settlement modes — whether physical or in cash. Gold and silver are the only commodities that have to be compulsorily settled in physical form if the seller holds on till contract expiry. In other commodity contracts, intimation to the exchange on or before the cut-off date will enable a seller to settle in cash on the contract expiry date. Whether you profit or lose on a trade, the broker, exchange and the government must be paid their due. So, factor in costs such as brokerage, commodity transaction tax (CTT), service tax and SEBI charges that add to the cost of your bet. If you think silver price will go up over the next month, you could buy a silver mini contract with a lot size of 5 kg currently trading at around ₹34,000 per kg. The margin money will be ₹8,500 and you also have to account for brokerage and other charges. If the contract moves up to ₹35,500 and you close the trade by taking a reverse position, that is selling the contract, you earn a profit of ₹7,500 (₹1,500 per kg) less brokerage and other charges, which will be credited to your account. But if the contract falls to ₹32,500, you will have to pay up ₹7,500 plus brokerage and other charges. The surge in the gold price last week has not resulted in increased buying of the precious metal by the world's two biggest gold clients: China and India. According to the Times of India, buyers have so far shown little interest in hitching their wagons to the gold rally. On Thursday, the price of gold climbed nearly $70 an ounce as turmoil on world financial markets and global economic fears sparked a return to safe-haven buying. Futures contracts in New York with April delivery dates jumped 5.8% to a high of $1,263.90 an ounce in massive volumes of nearly three times usual volumes. 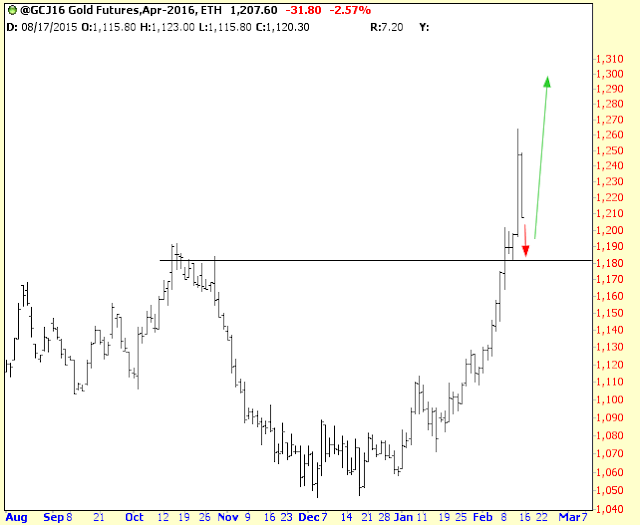 That moved gold into a bull market with gains topping 20% from the near six-year low struck mid-December. However by Friday, some of the rally had diminished, with gold futures slipping $7.10 to $1.240.60 an ounce. While Australia's Perth Mint had one investor order a million dollars worth of gold, it noted most of the interest is from Western clients. That is perhaps surprising given that Indian and Chinese buyers often swoop in to buy gold bars, coins and jewelry if they are confident of a sustained rally. On the contrary, despite offering a record discount of $40 to the global benchmark price, retail demand has "almost vanished" Times of India quotes one Mumbai-based jeweller. Discounts were also being offered in Japan, Hong Kong and Singapore. Between them, China and India account for around 45 percent of world gold demand. 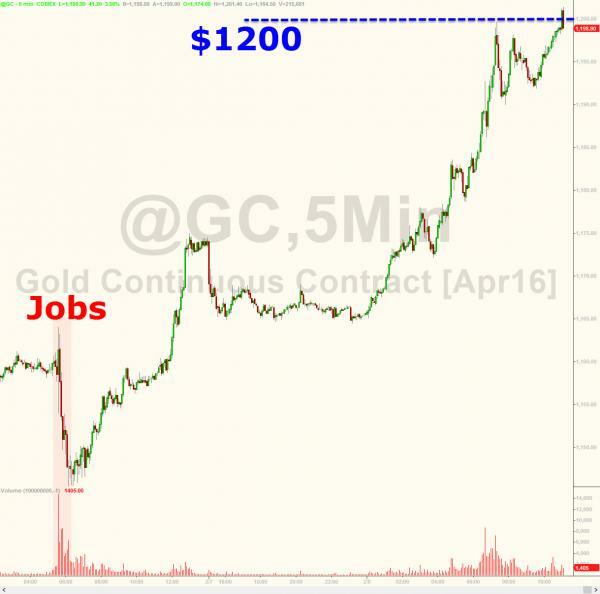 Meanwhile Dennis Gartman of The Gartman Letter was quoted on CNBC on Friday as saying that it might be a good idea to wait on gold. Gartman told CNBC's Squawk Box that gold is likely to correct before the Presidents' Day holiday on Monday, on the back of rising U.S. equities, and could slide to between $1,215 and $1,225, at which point he might buy in. Support $ 1183 or $ 1191.70 last top in October 2015. Next Target $ 1308. We’ll be blunt: most financial asset investors really hate gold. Anything – even leaving money in the bank – is better than owning gold since at least society has access to your capital through the banking system. Once you buy physical gold, no one has access to that sliver of your portfolio. Of course, that’s actually a feature for the owner since physical gold is no one else’s liability. So the notable rally in gold is essentially a protest vote against the global financial system, the equivalent of taking your ball and going home. 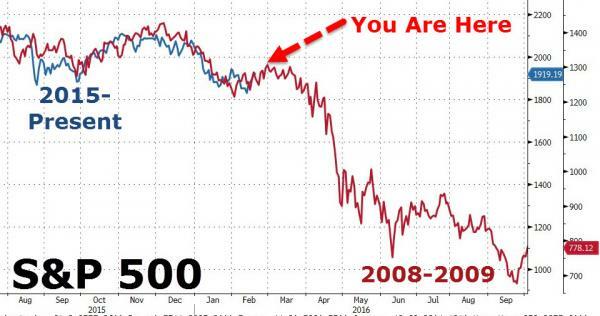 This only happens when investors think central banks have lost their way, and that’s not good news. Think of gold as a super-duty dive watch. It can go places humans can’t actually even dive. The watch will outlive the person wearing it. Kind of cool, but you don’t necessarily want to test it yourself. Finally, Colas adds...There are three reliable signs of a market bottom, where things get so bad it is safe to step in. First, when the S&P 500 drops 5% or more in one day. Second, when the CBOE VIX Index tops 40. And third, when everything sells off for a few days and correlations for all equities approaches one. None of these events have yet occurred. As investors continue to flock to gold, pushing prices to highs last seen one year ago, one major U.S. bank says it may also be jumping on the bandwagon. Technical strategist for Bank of America Merrill Lynch, Paul Ciana, told Kitco News that the bank went long gold at the $1,089 level as the metal formed a “rounded bottom pattern” earlier in the year. Now that the yellow metal has breached the $1,201 level, things are starting to look even more positive, he added. Thursday, prices rallied to levels last seen 12-months ago, with gold pushing back above $1,260 an ounce. Gold futures are up over 18% on the year, with April Comex gold settling the day up $53.20 at $1,247.80 an ounce. 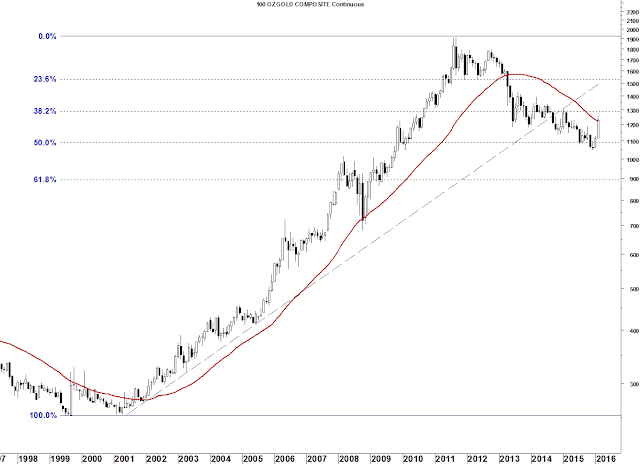 Ciana noted that gold may even have the “possibility” to move over $100 from there. 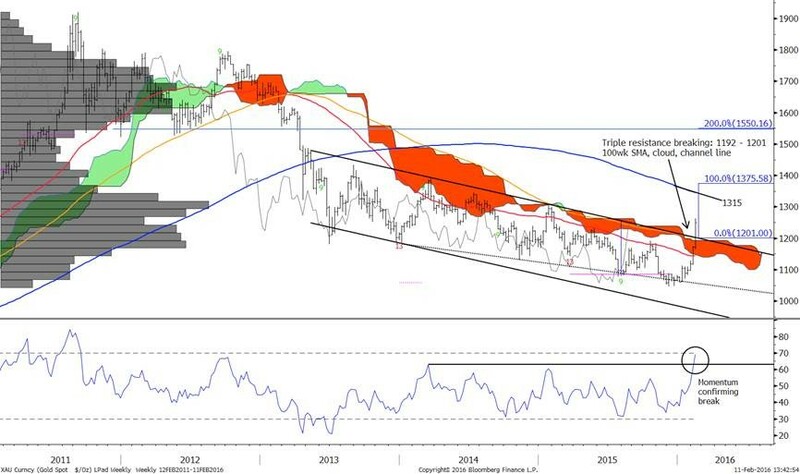 Looking at support levels, Ciana said that the under-$1,000 price tag that pundits were calling for earlier in the year ago may not be as probable given the recent upswing in gold prices. “Sub-$1,000 was definitely a possibility 2-3 months ago, but I do not really see that as likely at this point,” he said. The year continues to be bruising for risk assets and recent attempts at stabilisation have been unsuccessful. After a mild rebound, equities and US credit spreads are again close to their year’s worst levels. 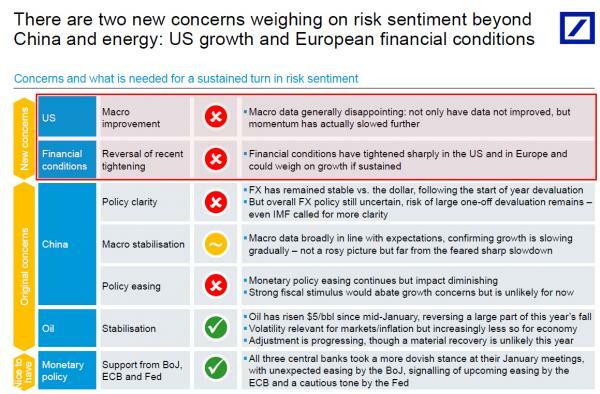 In addition to the initial concerns about China and energy, two new issues further weigh on risk sentiment: the slowdown in US growth momentum and the tightening of financial conditions especially in European financial credit. Macro data in the US have been weaker than expected and have raised questions about the sustainability of the recovery. Consumer spending and the services sector, which had been the drivers of growth, have decelerated. Fundamentals there still look sound, but weakness may persist and we have revised our below consensus growth forecasts further down. The Fed turned more dovish in response to the slower momentum and market volatility, and we no longer expect a rate rise in March. Indeed, at this stage it is difficult to see the Fed hiking more than once this year. The Fed was not alone in this dovish turn. 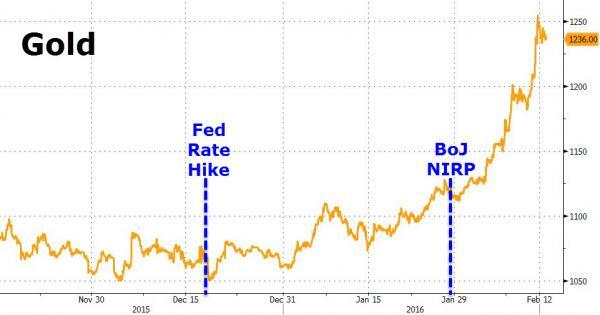 The Bank of Japan surprised markets by cutting rates into negative territory, and we actually expect a further cut later this year. As for the ECB, more easing should be forthcoming in March. A deposit rate cut seemed like the best course of action in response to purely external risks, but if the tightening of financial conditions does not subside an increase in the size of the QE purchase programme may be necessary. Our macro outlook for 2016 is broadly unchanged so far, uninspiring but not a disaster – but downside risks have risen both in the US and in Europe. Meanwhile, the absence of new news has moved attention away from China, but the underlying problem remains unresolved. As for oil, volatility is becoming less relevant for macro and markets. Despite this monetary policy support, until US growth, European financial conditions, China and oil concerns are put aside, markets will remain volatile and a sustained change in risk appetite is difficult. Fundamentally, we see 15-20% upside to equities, US credit spreads fairly priced and still believe in the stronger dollar story – but risks remain for all these views.Expectations for a drift higher in rates have not materialised, and dovish central banks and lingering macro concerns will continue to delay this normalisation. And here is the matrix breaking down all the recent conditions weighing on risk. We wish we could be as optimistic as DB that monetary support from central banks which are now running on fumes in terms of credibility, and that oil, which continues to gyrate with grotesque daily volatility, are "supportive." 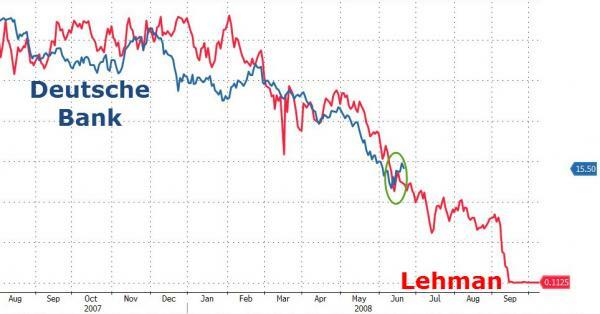 In fact, we are confused that DB is optimistic on central bank support: after all it was, drumroll, Deutsche Bank, which over the weekend warned against any more "easing" from central banks whose NIRP is now weighing on the German bank's profitability, something the market has clearly realized judging by the price of its public securities. A sharp and continuous rally in lead prices, for the past three weeks, has wiped out the losses the metal made in the first two weeks of January. The spot price on the London Metal Exchange (LME) has surged 10 per cent from $1,600 to $1,771 per tonne. On the domestic front, the lead futures contract traded on the Multi Commodity Exchange (MCX), which moves in tandem with the LME spot price, also rose 10 per cent over the same three-week period and closed on a stronger note at ₹120 per kg last week. 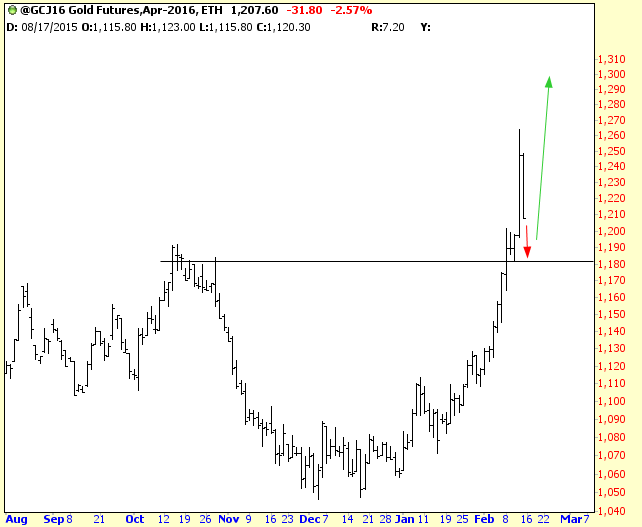 Two major factors have triggered the recent rally in lead. First is the recent weakness in the dollar which, in turn, has added sheen to assets like commodities and non-dollar currencies, in the last few weeks. 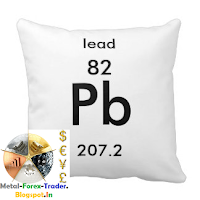 Two, recent data releases showing an increase in lead imports by China have also supported price rise for the metal. The country’s lead imports have increased about 45 per cent to 297 tonnes in December from the previous month according to data from Bloomberg. Reports also suggest that an increase in the demand for batteries due to more battery failures this winter season has also helped prop up lead prices. Though the recent rally in lead can also be attributed to short-covering, the charts suggest that the recent uptrend can possibly extend. Barring the brief fall below $1,600 to hit a six-year low of $1,554 in late November, LME spot lead has been range-bound between $1,600 and $1,800. The metal’s price rose to a high of $1,818 on Thursday last week, but fell back to close below $1,800 — the upper end of the range at $1,771. Price action in the coming weeks will need a close watch as it would decide whether the metal will stay in the $1,600-1,800 range or break above $1,800 to rise further. A strong break and a decisive weekly close above $1,800 can increase bullish momentum and take it higher to $1,850 immediately. A further move above $1,850 can see the rally extending towards the next target of $1,900. 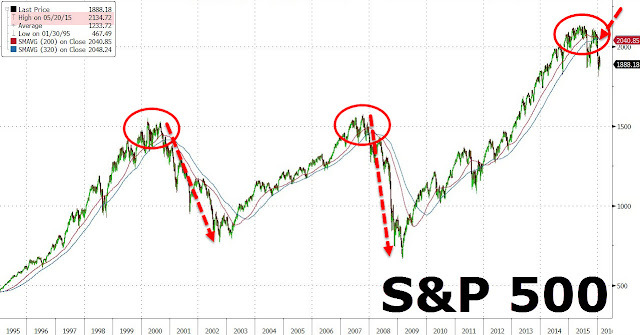 The lack of follow-through selling below $1,600 is a positive. Also, the metal has been moving inside a channel since October 2012. Since August 2015, this channel support in between $1,650 and $1,600 has been consistently limiting the downside and is providing a strong support. This is why a decisive weekly close above $1,800 will not just boost the bullish momentum, but also signal that the channel is intact. This increases the possibility of the LME spot testing $2,000 in the coming months. On the domestic front, the recent rally in the MCX-lead futures contract is signalling a break-out of the range-bound movement that has been in place for more than six months since June 2015. The contract is hovering near the 200 and 100-week moving averages, which are poised between ₹120 and ₹121. A strong rise above ₹121 can take the contract higher to test the next important resistance at ₹130 in the coming weeks. A further break above ₹130 can take the contract higher to ₹140. The contract has formed a strong base in between ₹110 and ₹105. The outlook will turn bearish only on a strong fall below ₹105. Such a fall will increase the danger of the contract falling to ₹100 and ₹98 thereafter. The short-term trend for lead is higher. The MCX lead futures contract has broken above an important resistance at ₹117. Immediate support is at ₹119 and then a significant support is at ₹117. As long as it stays above these supports, there is no immediate danger of a sharp fall in the contract. Intermediate dips to these supports may see new buyers coming into the market. At the moment, the downside is expected to be limited to ₹117. A rise to test the next resistance at ₹127 looks likely in the coming days. The outlook will turn negative for a fall to ₹115 and ₹112 only if the contract declines below ₹117. If the contract manages to surpass the immediate hurdle at ₹127, it can rise further to ₹130. Ministry considering tax sops for India's first global financial centre, steps to liberalise futures and options markets. Finance Minister Arun Jaitley and his team are believed to be considering steps to attract big names in investment banks and global brokerage and trading firms to the Gujarat International Finance Tec-City, known as GIFT City. On the banks of Sabarmati in Gandhinagar, Gujarat, the city has been positioned as a "global financial centre". Conceived in 2007 by Prime Minister Narendra Modi, then Gujarat's chief minister, the city has had a slow start. 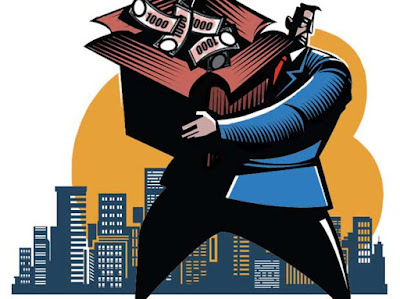 The coming Budget could offer substantial tax breaks and possibly a 10-year tax holiday, sources familiar with the developments said, adding exemptions from securities transaction tax (STT) and commodity transaction tax were among the incentives being considered for the GIFT City. However, a decision has not been taken, an official said. The finance minister is also likely to announce a number of capital market-related reform measures, including removal of STT and stamp duties on trading futures and options, clarification on tax treatment in the exchange-traded currency derivative markets and regulatory positions on participatory notes. Removing regulatory constraints on banks and mutual funds to participate in commodity futures, among others, were also being discussed, a senior government official said. Classified as a special economic zone (SEZ), GIFT city is being set up on the lines of global financial and information technology services hubs like Shinjuku (Tokyo), Lujiazui (Shanghai), La Defense (Paris) and the London Dockyards. It is aimed at attracting firms to open offshore banking as well as insurance and capital market intermediaries. According to existing provisions in the Act, SEZs are already allowed duty-free imports and are exempt from indirect taxes, besides 100 per cent income-tax exemption on export income for units for the first five years, 50 per cent for the next five years and 50 per cent of the ploughed back export profit for another five years. The developers and co-developers are given an income-tax holiday for 10 years under section 80IAB. "The government will definitely have to provide tax incentives to attract units in GIFT. Dubai International Financial Centre, for instance, provides zero tax rates. I am not sure if that will be possible, but that is the global benchmark for international financial centres," said Rakesh Nangia, managing partner, Nangia and Co. The DIFC offers zero per cent tax rate on income and profits (guaranteed for a period of 50 years), free capital convertibility and wide network of double taxation treaties for UAE incorporated entities. The GIFT City comes at a time when the government has announced phasing out of corporate tax exemptions. It has said that after March 31, 2017, sunset clauses with regards to tax exemptions will not be renewed. After that, no weighed deduction will be applicable for operation, maintenance and development of export units in SEZs. "It is yet to be decided whether they can exclusively incentivise GIFT," said the official quoted above. Apart from GIFT City, the budget-planners are said to be looking at measures to make India's equity, commodity and currency futures more competitive and liberalising them further. Some other measures could include lifting specific bans on any market segment, participant or product, making trading and clearing rules nationality-neutral and participant-neutral, allowing access to all foreign participants, as long as they meet financial action task force requirements, and over a longer-term period, getting in uniform know-your-customer norms, internationalising the rupee, and moving to a residence-based taxation regime. The genesis of these suggestions is a report by the standing council on international competitiveness of the Indian financial sector. The council was set up in 2013 and its report was made public only in September. The finance ministry had requested various financial regulators, including the Reserve Bank of India (RBI) and Securities and Exchange Board of India, to examine the report. "The regulators are coming back to the finance ministry with suggestions on which recommendations can or should be implemented. The suggestions on which there is agreement among all stakeholders could be part of the Budget," said another official. Regarding STT and stamp duty, the report had said that since the two levies add to transaction costs in equity derivatives, "STT should be removed. Stamp duty should not be applicable to cash-settled products such as index derivatives, as there is no delivery of the underling (product) taking place." STT, announced by then finance minister P Chidambaram in the first Budget of the earlier government, is now levied on all sale transactions on futures and options. It is 0.01 per cent of the traded price of futures and 0.017 per cent on options premiums. A 0.125 per cent STT is payable on the settlement price by the buyer of an option that is exercised. If STT is paid, there is no long-term capital gains tax. But, if it is not paid, the latter is levied at 10 per cent. The panel's report had divided its recommendations into three categories - short, medium and long-term - based on the nature of the reforms and the time that may be required to implement them. Longer term measures included internationalizing the rupee. Internationalization refers to a state where exporters from other countries agree to take payment in rupees and where the currency risks in international borrowings are borne by lenders rather than borrowers in India. According to RBI, countries that can borrow in their own currency are less susceptible to international crises. "Consider a time-bound plan for internationalization of the rupee, in line with the plans of the Chinese government for internationalization of the renminbi," the report had stated. With weakness returning to equities and crude oil on Monday, gold futures trading in New York attracted brisk buying from investors eager for alternatives amid all the market turmoil. In afternoon trade gold for delivery in April, the most active contract, was exchanging hands for $1,129.30 an ounce, up $12 or more than 1% compared to Friday's close and at its its highs for the day. Thanks to safe haven buying gold’s trading at a 3-month high and is now up 7.5% since hitting a near six-year low mid-December. Large futures speculators or "managed money" investors such as hedge funds dramatically raised bearish bets on gold during the final months of 2015. Net short positioning – bets that gold could be bought back at a lower price in the future – hit a record 2.4 million ounces during the final trading week of 2015. This year however hedge funds have been non-stop buyers pushing overall positioning firmly back in the black. According to the CFTC's weekly Commitment of Traders data released on Friday speculators added to long positions – bets that prices will rise – and trimmed short positions, leading to a more than 10-fold increase in net longs. Speculators also added 55% to net silver long positions while copper bulls came roaring back trimming overall short position by a third. Platinum longs were increased and shorts cut, but bullish palladium bets declined from the previous week. Both PGMs remain in small net long positions. Across 24 commodity futures markets money managers reduced bearish bets, entering a net long position for the first time in five weeks according to data by Saxo Bank. Better sentiment towards crude oil was the most notable feature of as bullish bets increased by 34% – the biggest percentage jump since 2010. Traders may be regretting the shift with US benchmark crude oil prices plummeting 6.2% to $31.50 a barrel on Monday. At the start of the year, across all commodity futures net short positions increased to 112,000 lots, the highest since government records began in 2009.